Surfer Contouring Software is a contouring and 3D surface mapping and plotting program that runs under Microsoft Windows. Surfer Contouring Software quickly and easily converts your data into outstanding contour maps and surface plots. And with all the options available in Surfer 9 contouring software, you can customize the maps to produce exactly the presentation you want. Producing publication quality maps in Surfer 9 contouring software has never been quicker, easier, and more satisfying. Surfer Contouring Software has well-organized and easy-to-read menus. Each of the menu items displays an explanation line. The help key gives the user a screen of explanations and examples for the selected option. Surfer's extensive users' manuals have numerous examples and include short tutorials with demonstration software. Output to hundreds of printers or plotters is provided in Surfer Contouring Software. Surfer contour maps give you full control over all map parameters. You can accept the Surfer 9 contouring software intelligent defaults to automatically create a contour map or double-click a map to easily customize map features. Display contour maps over any contour range and contour interval or specify only the contour levels you want to display on the map. And with Surfer Contouring Software, you can add color fill between contours to produce dazzling displays of your maps or produce gray scale fills for dramatic black and white printouts. A USGS DEM of the Morrison, Colorado, Quadrangle was used to create the above contour map. The right half is an enlarged portion of the DEM. Surfer 9 contouring software 3D wireframe maps provide an impressive three dimensional display of your data. Use color zones, independent X,Y,Z scaling, orthographic or perspective projections at any tilt or rotation angle, and different combinations of X, Y and Z lines to produce exactly the surface you want. Drape a color-filled contour map over a wireframe map to create the most striking color or black-and-white representations of your data. The possibilities are endless. 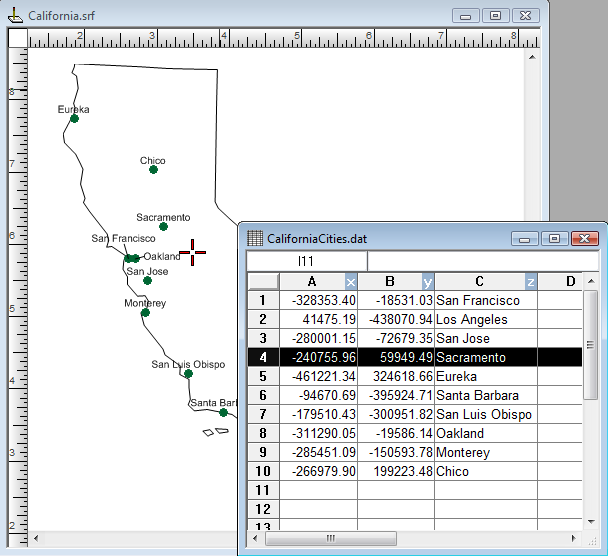 A wireframe map can be used to display any combination of X,Y, and Z lines. A USGS SDTS DEM file was used to create this map and color zones were defined for the X and Y lines. A vector map of Mt. St. Helens overlaid on a contour map. Use a color scale bar or legend to indicate the magnitude of the arrows. A vector map of Jay Peak, Vt. overlaid on a wireframe map. Surfer 9 contouring software image maps use different colors to represent elevations of a grid file. Create image maps using any grid-type file: GRD, DEM, DDF, HDR. Surfer automatically blends colors between percentage values so you end up with a smooth color gradation over the map. You can add color anchors at any percentage point between 0 and 100. Each anchor point can be assigned a unique color, and the colors are automatically blended between adjacent anchor points. This allows you to create color maps using any combination of colors. 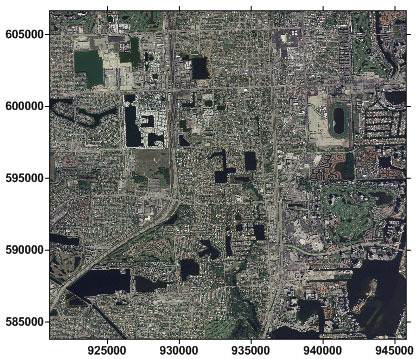 Any color fill you choose for an image map can be used with any other image map, even if the associated grid files cover distinctly different Z ranges. Image maps can be created independently of other maps, or can be combined with other maps. They can be scaled, resized, limited and moved. Add color to your image map to customize it. Surfer 9 contouring software Shaded Relief maps create a shaded relief map from a grid [.GRD] file or USGS DEM file. 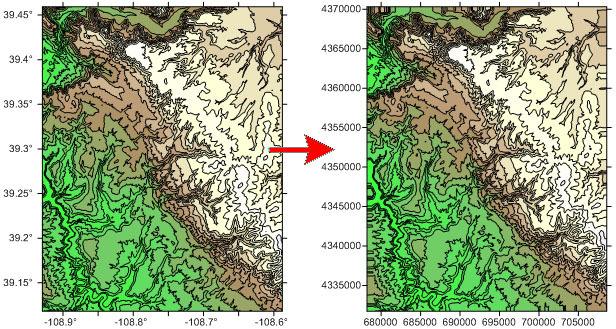 These maps use different colors to indicate surface slope and slope direction relative to a user-defined light source direction. Surfer 9 contouring software determines the orientation of each grid cell on the surface, and assigns a unique color to each grid cell. Colors on shaded relief maps are associated with light striking the surface. The light source can be thought of as the sun shining on a topographic surface. 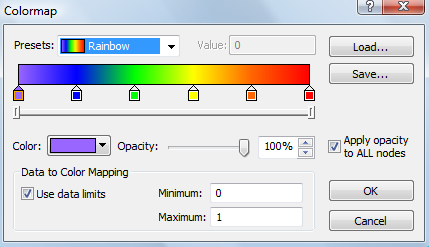 Surfer automatically blends colors between percentage values so you end up with a smooth color gradation over the map. You can add color anchors so each anchor point can be assigned a unique color, and the colors are automatically blended between adjacent anchor points. This allows you to create color maps using any combination of colors. Shaded relief maps can be created independently of other maps, or can be combined with other maps in map overlays (using the Overlay Maps command). Shaded Relief maps can be scaled, resized, limited, and moved in the same way as other types of maps. Adjust the light source angle when creating shaded relief maps. Post maps show X,Y locations with fixed size symbols or proportionally scaled symbols of any color. Create post maps independent of other maps on the page, or overlay the posted points on a base, contour, vector, or surface map. For each posted point, specify the symbol and label type, size, and angle. Also create classed post maps that identify different ranges of data by automatically assigning a different symbol or color to each data range. Post your original data point locations on a contour map to show the distribution of data points on the map, and to demonstrate the accuracy of the gridding methods you use. 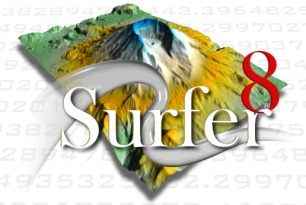 Surfer 9 contouring software can import maps in many different formats to display geographic information. You can combine base maps with other maps in map overlays, or can create stand-alone base maps independent of other maps on the page. You can load any number of base maps on a page. Base maps can be imported from DXF, GSI, BLN, SHP, LGO, BNA, GSB, DLG, LGS, MIF, E00, USGS SDTS DLG DDF, EMF, WMF, TIF, PCX, BMP, PLT, CLP, TGA, PCX, JPG, PNG, DCX, WPG, PCT, and other formats. It is easy to overlay a base map on a contour or surface wireframe map, allowing you to display geographic information in combination with the three dimensional data. Map overlays give you a way to combine any number of contour, wireframe, vector, base, and post maps. Draping a filled contour map over a wireframe map produces the most striking display of 3D data possible. And because you can overlay any number of maps, you can show any amount of data on a single map. This map was created by overlaying two contour maps, a basemap, and a wireframe map in order to display contaminate spread. The gridding methods in Surfer 9 contouring software allow you to produce accurate contour, surface, wireframe, vector, image, and shaded relief maps from your XYZ data. The data can be randomly dispersed over the map area, and Surfer's gridding will interpolate your data onto a grid. You have a multitude of gridding methods to choose from, so you can produce exactly the map you want. With each gridding method you have complete control over the gridding parameters. If your data are already collected in a regular rectangular array, you can create a map directly from your data. 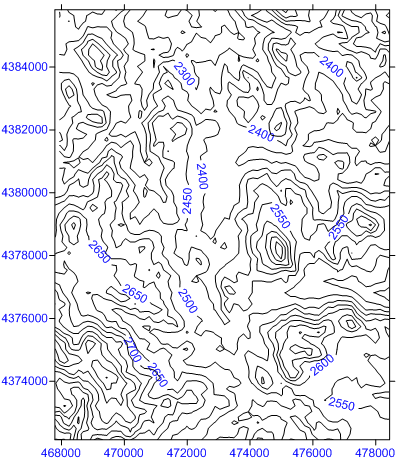 Computer generated contour maps have never been more accurate. 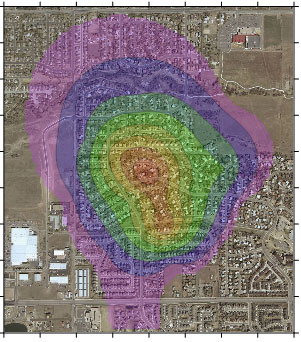 Use the variogram modeling subsystem to quantitatively assess the spatial continuity of data. Variograms may be used to select an appropriate variogram model when gridding with the Kriging algorithm. Surfer 9 contouring software uses a variogram grid as a fundamental internal data representation and once this grid is built, any experimental variogram can be computed instantaneously. Instantly create variograms in Surfer 9 contouring software to quantitatively assess the spatial continuity of your data. Define faults and breaklines when gridding your data. The data on one side of the fault will not be directly used to calculate grid node values on the other side of the fault. When the gridding algorithm sees a breakline, any data points that lie directly on the breakline take precedence over an interpolated value. Use breaklines to define streamlines, ridges, and other breaks in slopes. Unlike faults, breaklines are not barriers to information flow and the gridding algorithm can cross the breakline to use a point on the other side. The gridding methods that support faults are: Inverse Distance to a Power, Minimum Curvature, Nearest Neighbor, and Data Metrics. Breaklines are supported by: Inverse Distance to a Power, Kriging, Minimum Curvature, Nearest Neighbor, Radial Basis Function, Moving Average, Data Metrics, and Local Polynomial gridding methods. 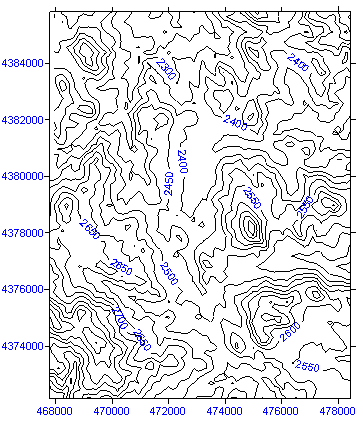 A contour map that features a fault is displayed here. Faults and breaklines are specified when gridding your data. Virtually any operation that you can perform interactively can be controlled using an Automation-compatible programming language such as Visual Basic, C++, or Perl. Surfer includes GS Scripter - a Visual Basic-compatible programming environment that lets you write, edit, debug, and run scripts. In this way you can automate repetitive tasks, create front ends for running Surfer, or carry out any task that Surfer can do. See all your data! Make colors, map layers, fill patterns, images, and missing data for image maps and shaded relief maps transparent! You have full control over the opacity percentage. Import and Export Georeferenced Images! No more guesswork! Save time and frustration by importing georeferenced image files in their real world coordinates, ready to combine with other map types. Also export your maps in georeferenced images files! You can save the spatial reference information in Golden Software Reference format, internal referencing format (ie. GeoTIFF), with an ESRI world file, or Blue Marble RSF format! Add, Remove and Edit Individual Objects in Base Maps! Convert the Projection of Data in the Worksheet! 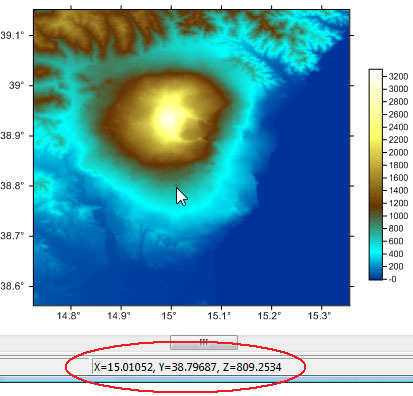 Project your data from more than 1,500 predefined coordinate systems or define your own custom projection or datum! 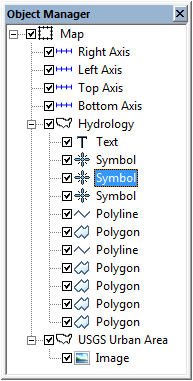 Add frequently used coordinate systems to your Favorites list to be easily accessible in the future. Area and length calculations are here! Surfer 9 contouring software reports the area and perimeter length of polygons and the length of polylines in a base map. Simply double click on the polygon or polylines and the information is reported. The polygons and polylines don’t even have to be a part of the original base map file. Import the base map, enter the base map group and simply draw the polygon or polylines right on the base map! It’s that easy to get area and length values! 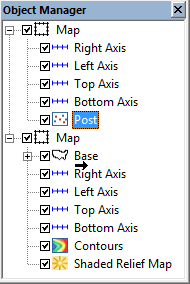 Move Individual Labels on Post Map with Mouse. Eliminate overlapping and unreadable post map labels by effortlessly moving individual post labels to new locations by dragging and dropping them with your mouse! Labels that have been moved can optionally be linked to the corresponding post map symbol with a connection line. Save Classes for Classed Post Map! Create your classes for a classed post map exactly how you want them, and save the settings to a file! Make your classed post maps consistent every time without having to manually enter the same class specifications and class settings over and over again. Know Exactly Where You Are! 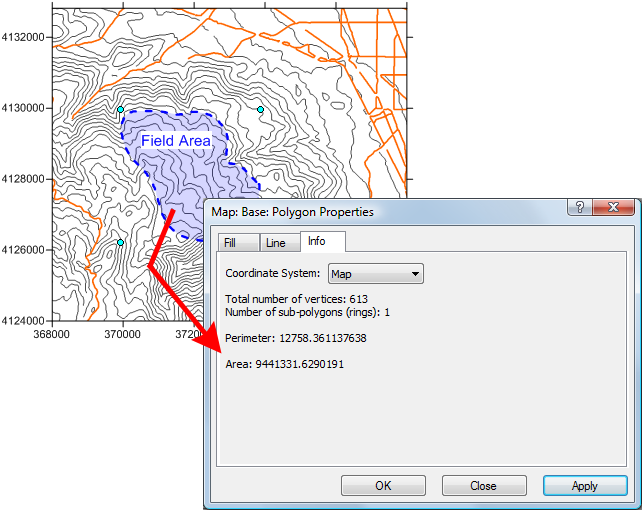 Surfer 9 displays the exact XYZ coordinates of the cursor location when traversing a map! The coordinates update automatically as the cursor is moved. Enable or disable the cursor tracking between multiple maps! Click the mouse on one map to see the location of the cursor click on all other maps in the plot window that use the same coordinate system! You can also link post maps to the worksheet data. Select a point in the plot window and the closest point in the worksheet will be highlighted, or select a point in the worksheet and that point will be identified in the plot window! Click on a specific location in one map and the same location will be identified on other maps in the plot window! You can also click a location on a map, and the closest point to that location will be highlighted in the worksheet. 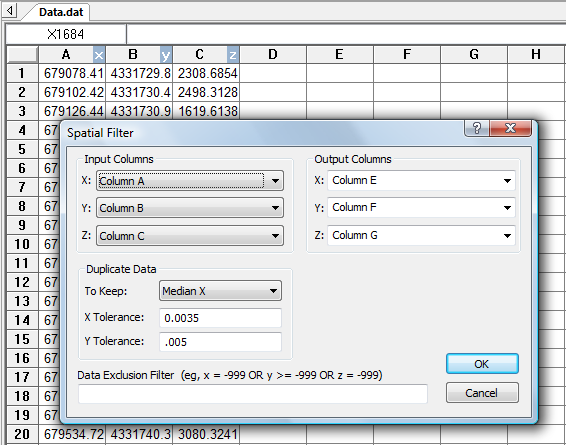 Alternatively, you can select a point in the worksheet and that point will be identified in the plot window! Analyze Spatial Distribution Trends in Your Data! Spatially filter your X, Y and optional Z coordinates in the worksheet. 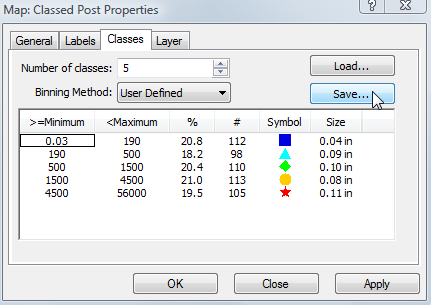 Filter your data prior to creating post maps, variograms, or grid files and saving the data for use in other programs. The spatial filter can be used to remove duplicates and exclude data based on an expression using the built-in, powerful expression language. 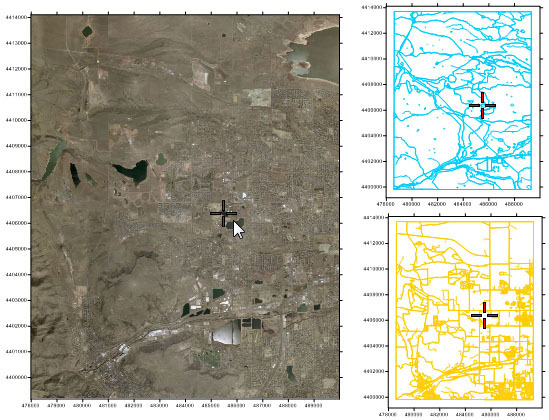 Spatially filter your data for gridding, creating post maps or variograms or for use in other programs. Your maps are smoother than ever! Surfer 9 supports antialiased text and line display to help your maps look their best! Antialiasing is easily turned off at any point. Choose to turn off antialiasing for text and lines. The plot window, worksheet window, and grid node editor windows are displayed as easily accessible tabbed documents! When more than one window is open, tabs appear at the top of the screen, allowing you to simply click on a tab to switch to that window. Plot, worksheet and Grid Node Editor windows are displayed as tabs! Simply click on any of the tabs to access that window. Easily create just the color you want! 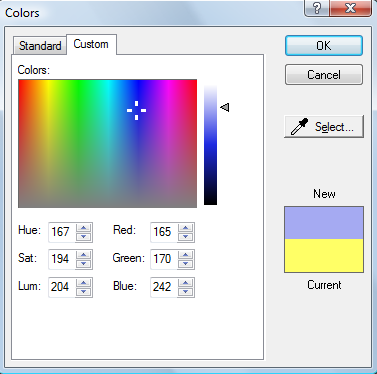 Choose from a standard palette of colors, select to match any color on the screen, or easily create custom colors! Select the exact color and shade you want! The new colormap system makes it easier than ever to select a color spectrum or create your own custom color gradient. Add and Remove Map Layers in the Object Manager! Surfer 9 makes it easy to overlay and remove map layers from maps! Simply drag map layers into and out of map frames, and delete individual maps layers from maps without having to break them apart first. Simply drag and drop map layers into new map frames! Drag the “Post” layer into the map frame containing the Base, Contours and Shaded Relief Map layer to overlay them! Keep Your Custom Limits and Scale! 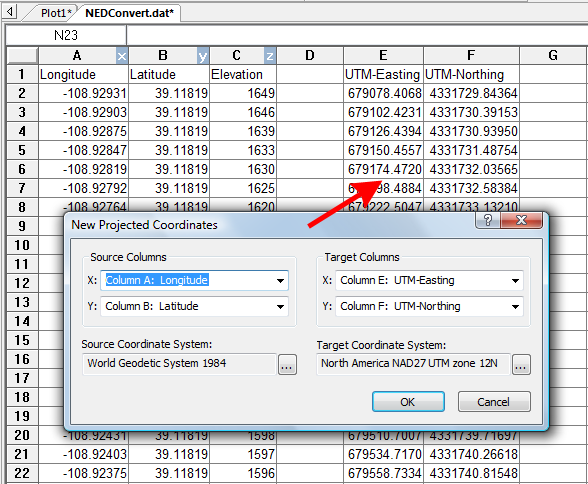 Customize your map limits and scale, then reload the data or add new data. If the new data exceeds the current limits, you can choose to either keep the existing custom limits and scale, or have Surfer 9 contouring software automatically update them to include the new data. Save time! With just a click of the mouse, reload data and grid files simultaneously for all of your maps! Find the data you need or replace all values at once with the Find and Replace commands in the worksheet! Design your project with precision! Perfectly align your objects, either horizontally or vertically, with the advanced alignment tools.